With a universally-adored, not-loathed-by-anyone holiday approaching, we thought we’d get in the spirit and share how you can show your learners some love this Valentine’s Day and beyond. The first step is to make sure you’re speaking the right languages. In “The 5 Love Languages: The Secret to Love That Lasts,” author Gary Chapman writes about the five main ways that people send and receive love. One person’s primary love language might be quality time, while yet another person might deal in acts of service. In essence, Chapman argues that understanding what mediums your partner prefers can help to make love last forever. Now, we don’t fancy ourselves anthropologists like Chapman, but we do know a thing or two about how people learn, and we suspect the idea of love languages applies to our arena. We believe the medium through which we educate learners impacts their knowledge retention as much as the content itself. And we believe that learners prefer some mediums to others. Jane Hart, the founder of the Centre for Learning & Performance Technologies (C4LPT), published a report in January 2018 that supports that theory. 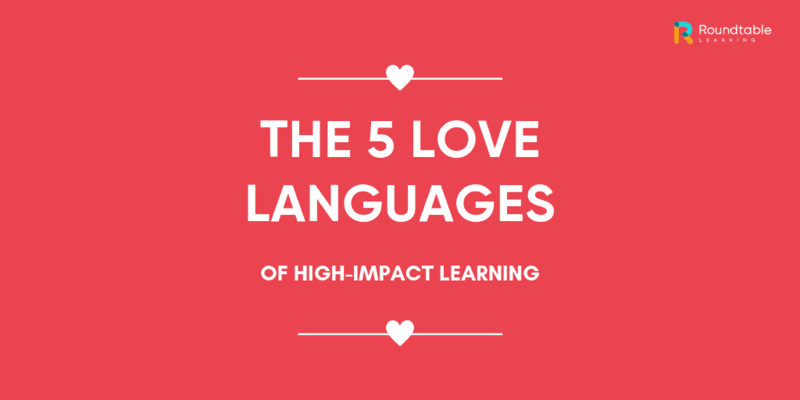 We might be caught up in the romance of the season (we totally are), but these sound to us like the five main love languages of high-impact learning. To be clear, we are not conflating learning styles — visual, auditory, reading, kinesthetic — with learning languages; there is plenty to discuss about the former. Rather, these love languages describe the environments in which people prefer learning occurs, no matter the content and the style in which it’s delivered. There are innumerable ways for someone to learn through daily work experiences, just as there are countless ways to spend quality time with your partner. But, the overarching environment and the conditions unique to it remain the same, supplying lovebirds and learning professionals with frameworks to follow. Wondering how you can add this information to your arsenal of love arrows? You’re in luck, Cupid. We have some tips for speaking each language. This medium being the most preferred one doesn’t surprise us, as it reinforces the 70/20/10 model. People like to learn by doing and learning from experience. Learning professionals should try to mimic that dynamic in any formal training; create a controlled environment in which learners can make choices and face the consequences — good and bad. Also, knowing that learners prefer to learn by doing, learning professionals should give them proper performance support so that they can get the most out of those autonomous moments. People are social beings. We like to work together; we like to learn together. And according to Hart’s survey, we love to do the former so that the latter happens as a result. That is, we love to learn by sharing knowledge with each other. For learning professionals, this is justification to weave social learning and gamification into your formal training. And on a more fundamental level, this data is a reminder to do a needs analysis when possible. Make sure you have a culture in place that encourages your workers to collaborate; also, check that your workers have the tools to help them to do so. The internet has revolutionized the world. Make sure your learners — whether they’re on the go or seated at a desk — have adequate access to it so that they can find the answers they need when they need them. Having advocated for internet access, we must also acknowledge that the internet’s capacity for information is a gift and a curse. One Google search for “eLearning” yielded 152 million results in less than one second. In other words, sometimes workers can use a little help in finding the content that’s most relevant and helpful to them. Learning professionals have an opportunity to differentiate their organization from others by offering employees a carefully-curated online library of web resources. By pairing internet access with a designated hub of impactful resources, you master two learning love languages at once. Peer-to-peer collaboration isn’t the only interaction learners desire. The fifth-most preferred way to learn, according to Hart’s survey, is through manager feedback and guidance. Fluency in this learning love language begins and ends with highly competent managers. Learning professionals must make sure their managers are properly trained to offer feedback and guidance to their employees. Think another learning love language should have cracked the top five? Tell us why on LinkedIn! And be sure to see how Roundtable Learning can help you to get your footing in any of the so-called love languages of high-impact learning.